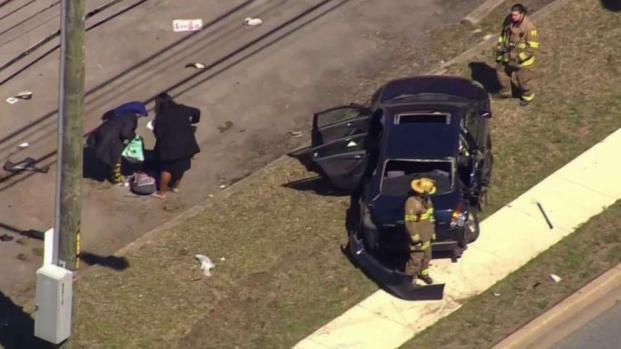 Five local high school students were hurt, three of them seriously, during a crash in Greenbelt, Maryland, on Tuesday, authorities say. Officers and medics responded to the scene of the crash in the 9800 block of Good Luck Road shortly before noon and found an SUV and a car had severe damage. Police Chief Hank Stawinski said during a news conference that five DuVal High School students were in a Nissan sedan going back toward the school when a vehicle exiting a driveway struck them, sending the Nissan spinning head-on into the path of an oncoming vehicle. Stawinski said none of the students in the car were wearing seatbelts and it appeared that three of them in the backseat were partially ejected from the car. All three have serious injuries. Stawinski said authorities are "guardedly optimistic" they will survive. 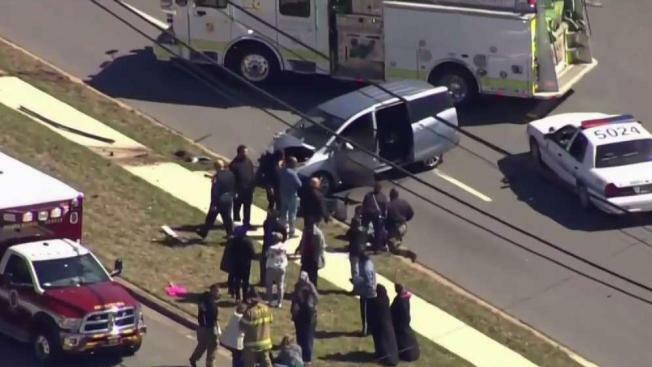 Five students were not wearing their seatbelts when they were injured in a car crash in Greenbelt, Maryland, police say. Three of the students are seriously injured. News4's Jackie Bensen reports. The student driver and passenger were not seriously hurt because the car's airbags deployed, Stawinski said. "As a parent, immediately as I heard about the accident and after my child was dismissed from school today, I reiterated with him the importance of wearing his seatbelt and driving safely," said Dr. Monica E. Goldson, interim CEO for Prince George's County Public Schools. "And so I ask our parent community to take this time to do that with their students tonight." Goldson said the students are seniors at DuVal and the driver had permission to not be at school at the time of the crash. Two people in the other vehicle suffered minor injuries, Stawinski said. First responders had to call additional ambulances and took all seven of the injured to hospitals.